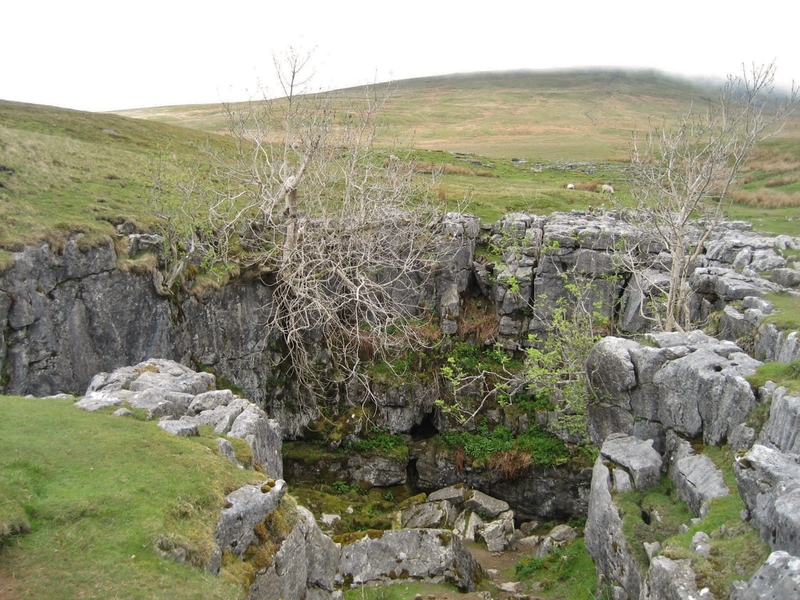 Caves and potholes grace the Ingleborough underworld. Above them, on the surface – hundreds of depressions and hollows, known as ‘dolines’ – are sure indicators of this extensive underground drainage, and they come in all shapes and sizes. 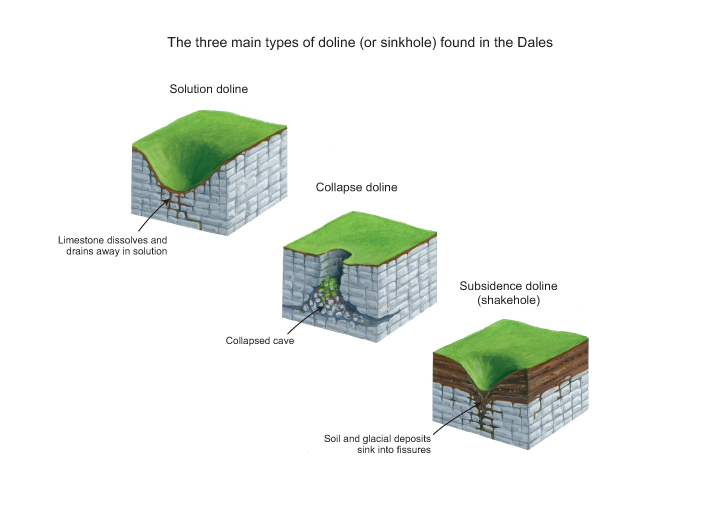 There are three main kinds of doline, each formed in a slightly different way. 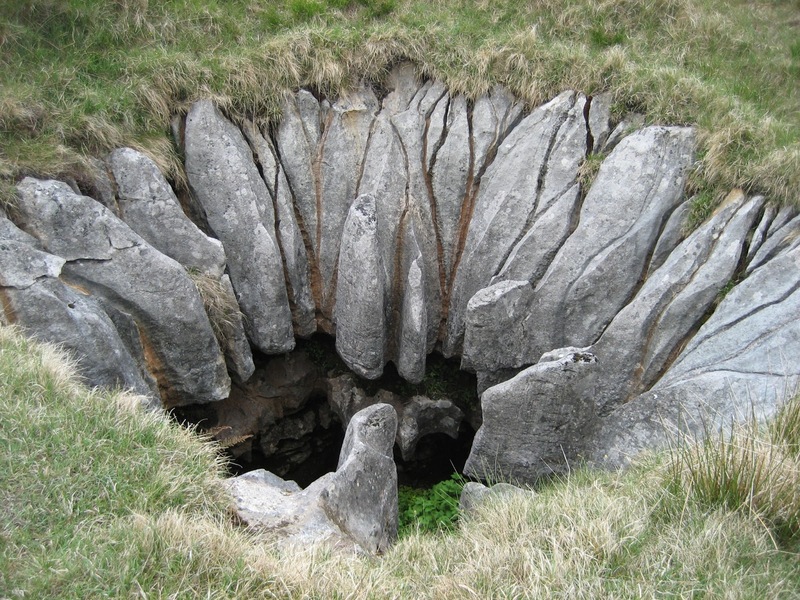 The most famous (and most common) are the subsidence dolines known in the Dales by their local name of ‘shakeholes’. These pepper the Ingleborough perimeter, as a quick glance at the Ordnance Survey map will show, but are particularly abundant around Newby Moss and Clapham Bottoms. The shakeholes themselves are formed entirely in the soil, alluvium or till cover overlying the limestone. Most are about 2 -10 metres across, with their depth only limited by the depth of the soil itself. The soil is effectively washed down into fissures and voids in the bedrock beneath, causing the overlying material to slump into the funnel created – but even this can vary. Shakeholes known aptly as dropout dolines form where weaker soils are washed out from beneath overlying arches of more cohesive (harder to break up) soil which eventually ‘drop’ into the void. Suffusion dolines form more slowly when soil is washed gradually downwards into the void beneath. 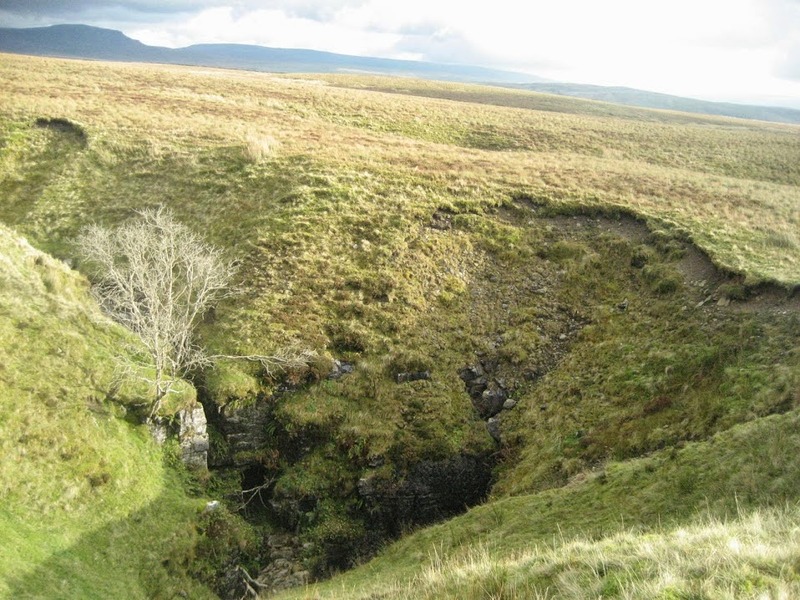 The most famous subsidence doline on Ingleborough is the gigantic surface opening of Marble Pot, (SD759730) above Clapham Bottoms; an opening that became significantly bigger overnight in December, 1980, when an entire side of it crashed 30 metres into the stream-washed fissures beneath. Though seldom visited and off the beaten track to most walkers – this awe-inspiring feature is well worth seeking out. The two remaining types of doline are, by contrast, formed in the limestone bedrock itself. Solution dolines form where water funnels into a fissure in the limestone and the surrounding rock is gradually lowered to produce a depression. These can be formed beneath a soil cover, or above it – often with impressive results. The Fluted Hole on Scales Moor has beautiful symmetrical plates of fissured limestone surrounding the central hole like petrified flower petals – while others see it as a group of stone doves drinking from a birdbath! Any large solution dolines must be very ancient as dissolution is a very slow process. Many of them pre-date the last glaciation and were over-ridden by ice during the Devensian. Collapse dolines, as their name suggests, form by rock collapse into underlying cave chambers. 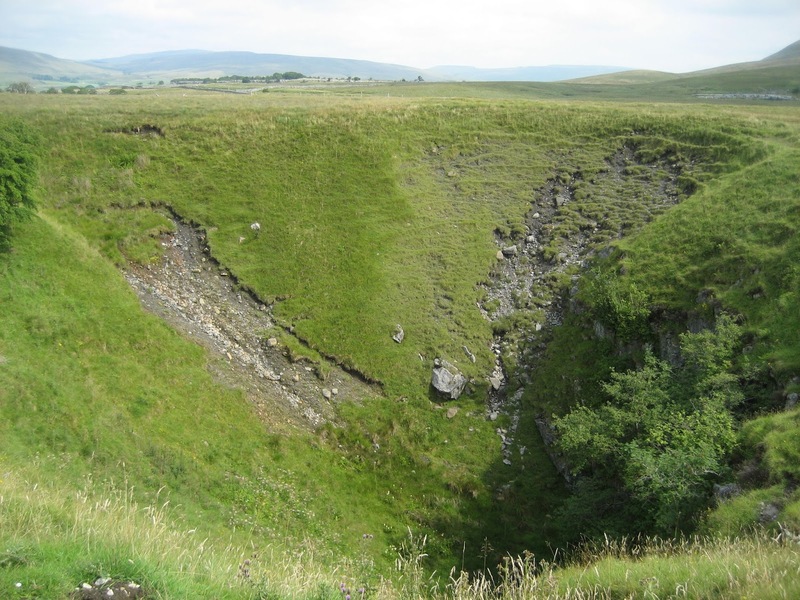 A fine example is the hole surrounding the entrance to Bar Pot (SD752723), the experienced caver’s traditional route into the Gaping Gill system. Most dolines in the limestone bedrock are, however, formed by a combination of both solution and collapse. 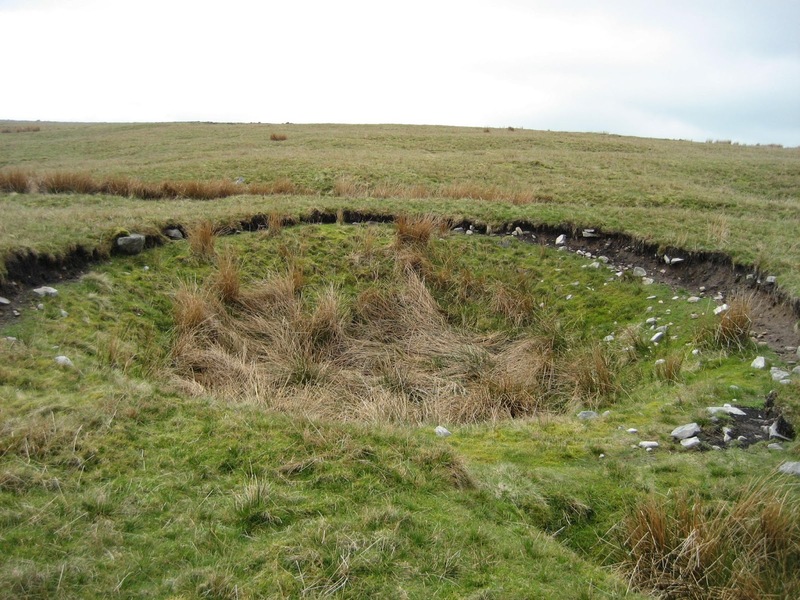 The best known, and often said to be the largest of them all, is Braithwaite Wife Hole on the east flank of Chapel-le-Dale (SD743762). This colossal surface opening is over 60 metres (180 feet) across and nearly 30 metres deep. Sliding down into it is a thrilling, if uncomfortable, diversion for any inquisitive Ingleborough climber, and the view of the sky from the base of the hole is amazing in itself. Watching people trying to get out can be quite amusing! It is very old, and no doubt much deeper than it appears, as the last glaciation washed in large amounts of till. Mr Braithwaite, some say, threw his badly behaved wife into the hole, though ‘Barefoot Wives’ Hole’ has been another name for it. Whatever the origin, in these days of political correctness – perhaps imaginative cavers need to add a few ‘husbands’ to shakeholes here and there!